December | 2013 | The Fantastic Flame On! Welcome to the third part of our year in review, touching base with all the goings-on across 2013 for the Fantasticast. Today, we’ll be covering the last four months of the year, as the show underwent the biggest changes since its inception. Sam Savage joined us for episode 48, bringing along a new cover design for the episodes with him. After some discussions, we decided that the new design would better show off the artwork from two masters of comics – Kirby and Georgiou. 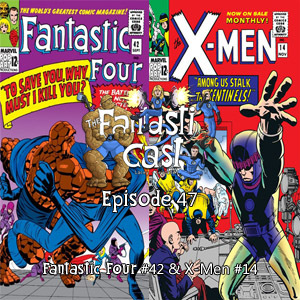 We finished up our coverage of the Frightful Four saga as published in Fantastic Four #43. Lo, There Shall Be An Episode. September was a bit of a guest-host-a-palooza. Episode 50, titled The Gentleman’s Name Is… Niemeyer, saw Charlie Niemeyer join us to kick off the run of stories that would introduce the Inhumans to the Marvel Universe. Fantastic Four #44 was where it all kicked off, featuring an assault from Gorgon. Episode 51 was titled Agents of F.O.U.R, and it had nothing to do with any underwhelming TV series that may or may not have premiered around this time. Instead, Charlie Niemeyer returned to help us continue to explore the introduction of the Inhumans, leading up to the introduction of Black Bolt on the final pages of Fantastic Four #45.
Who Seeks The Seeker was the title of episode 52, as the Inhuman saga continued to develop. 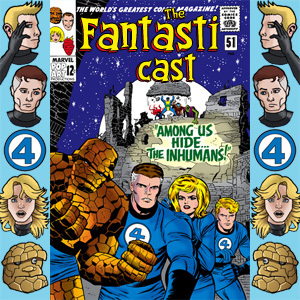 We covered Fantastic Four #46, and we also launched our first ever Listener Question Of The Month, where we asked out listeners to consider which Fantastic Four stories they felt were the most under-rated. 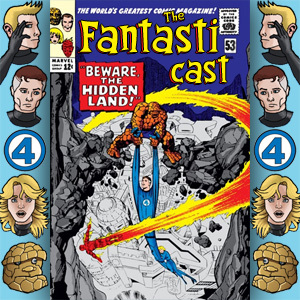 Episode 53 was the last episode to feature an esoteric episode title, Sue’s Inappropriate Haircut, a reference to how the journey to the Forbidden City in Fantastic Four #47 might have been overshadowed by Sue deciding to change her hairstyle at the wrong moment. And then it all went a little wrong. Unable to get the editing done for a weekly release, we decided to postpone the second part of the Galactus Saga and release a fill-in episode. Comprising of Steve’s two explorations into the world of singing, episode 54.5 was A Brief Musical Interlude, and collected the fake Fatman on Batman opening, and the reworking of The Devil Went Down To Georgia. 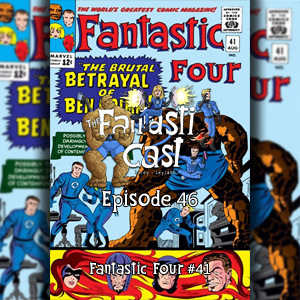 Following the attempted alienation of our audience with the musical episode, we returned at the start of November to provide coverage of Fantastic Four #49 in episode 55 – If This Be Doomsday! And then we took a brief break again. The cheekily-named episode 55.5 – We’ve Made A Huge Mistake featured the best outtakes and fake-openings from the first 10 episodes of the show. 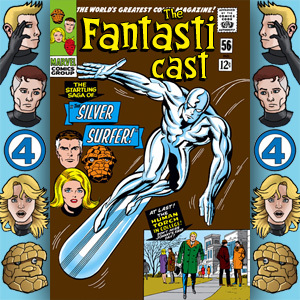 Issue 50 of the Fantastic Four was celebrated on episode 56 – The Startling Saga Of The Silver Surfer. We wrapped up our coverage of the Galactus saga and enjoyed an extended epilogue that introduced new plot lines to be paid off in future issue. And Whitey Mullins, who wouldn’t be paid off in future issues. 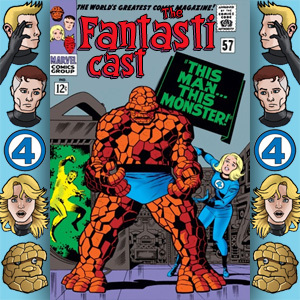 This Man, This Monster is regarded as the greatest of Lee and Kirby’s standalone issues, and on episode 57, we took the classic issue 52 of the Fantastic Four as our subject. We then took another brief break, this time caused by some unfortunate microphone settings that rendered Andy’s side of the recording completely unusable. As the title We’ve Made A Terrible Mistake All Over Again suggested, episode 57.5 was another roundup of outtakes and fake introduction. December became our biggest month so far on the Fantasticast. We kicked off with episode 58, Introducing The Sensational Black Panther. 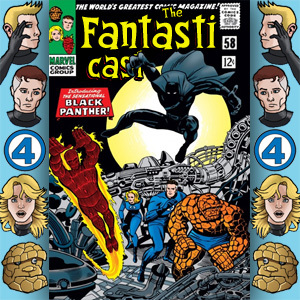 Covering issue 52 of the Fantastic Four, this episode saw the Black Panther’s introduction to the Marvel universe, the first black superhero to appear in comics. We also launched our second Listener Question Of The Month, asking for your feel-good Fantastic Four reading experiences. 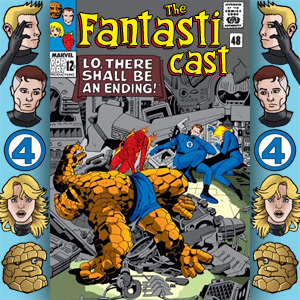 The Way It Began was our final coverage of Lee/Kirby Fantastic Four for 2013. 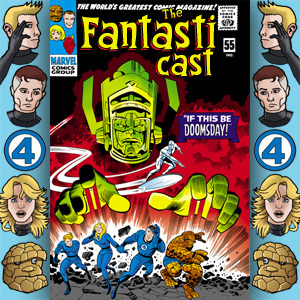 Episode 59, covering Fantastic Four #53, gave the origin (but not the name) of the Black Panther, a gripping Shakespearian tale of murder, revenge, and giant red elephants. We then kicked off our now-traditional end-of-year shows with our Podcaster’s Choice for 2013. The rules were simple – we each got to choose an issue of the Fantastic Four and its spin-offs from outside the Lee/Kirby run to take a look at. Andy was up first, and episode 60 saw us cover Marvel Two-In-One #74, guest-starring the Puppet Master and Bova, the mutated cow midwife. 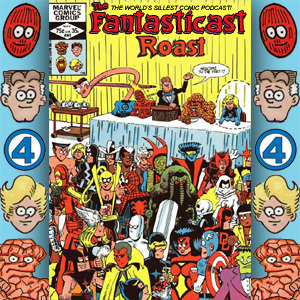 Steve’s choice of issue to close out the year was Fred Hembeck’s Fantastic Four Roast, a massive jam issue celebrating 20 years of publication of the Fantastic Four, masterminded by cartoonist Fred Hembeck. And that just about wraps it up for 2013. In 2014, we aim to complete the Lee/Kirby Fantastic Four issues, assuming that we can keep up with the weekly schedule. We’ve got a couple of great guest hosts lined up for the first few months of the year, and a nice long list of prospective guest-hosts to dip into before the end of year. Have a great new year, and we’ll see you in 2014. Welcome back to our run-down of the past year in the life of the Fantasticast. We’re reliving all the comics, guest-hosts and more from May, June, July and August of 2013. Let’s get to it! May brought us our first three-episode month of the year. Episode 38 saw the debut of Steve’s singing, as his reworking of the Fatman on Batman theme gave rise to the episode title Two Not-That-Fat Men On Fantastic Four. We looked at the tyrannical businessman Gideon in Fantastic Four #34, got caught up in Quicksilver and Scarlet Witch’s moral anguish in Strange Tales #128, and take a fleeting glimpse at Avengers #12. 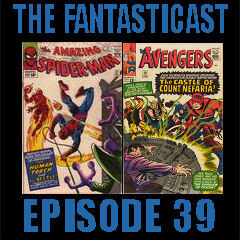 Episode 39 was our first Fantastic Four-less episode, as an incredibly busy month for guest-appearances of the team meant we had to split the books into two episode. In Amazing Spider-Man Classic, we covered the Beetle’s first battle against Spider-Man in Amazing Spider-Man #21, and took a look at how Count Nefaria managed to keep the Fantastic Four at bay whilst assaulting the Avengers in Avengers #13. 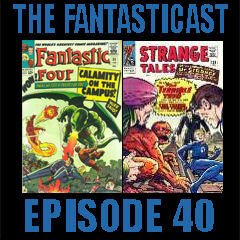 Episode 40 was when we actually got round to covering some issues of Fantastic Four and Strange Tales, in Love (And A Sodding Big Dragon) Is In The Air. As the title suggests, Fantastic Four #35 was the first appearance of the Dragon Man, and the second (and final) lead appearance from Diablo in the Silver Age. Unfortunately, Strange Tales #129 saw the return of the Terrible Trio in one of the least-satisfying issue of this spin-off title to date. Andy’s Amazingly Awesomely Authentic American Accent was a bit of a first for The Fantasticast. 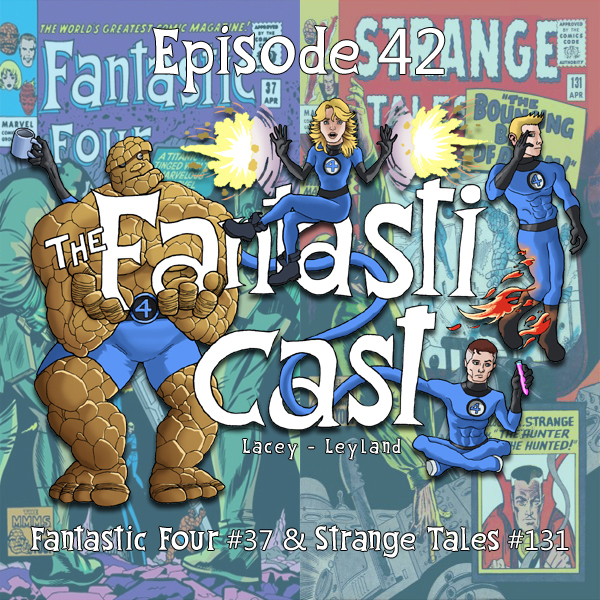 Not only did we encounter The Frightful Four for the first time in Fantastic Four #36, but the (surprisingly mute) appearance of The Beatles in Strange Tales #130 gave us an opportunity to revisit one of our previous guest-hosts. Joshua Lapin-Bertone is a huge Beatles fan, so it made sense to have him along for the ride, and when scheduling issues meant that Andy could be a part of the record, we got to have a little fun at his expense. Happy Birthday Us was our traditional birthday episode, as Steve and Andy celebrate on consecutive days. But, as the episode image showed, things were changing. Artist Michael Georgiou had presented Steve with a cover image for the show, and listener Sam Savage started working to incorporate that into the episode cover images that Steve hated having to create. It would take a few weeks before we all hit on the final design, but having a stronger visual identity for the show was a big step forward. The Fantastic Four went up against the Skrull Empire in search for some good ol’ fashioned revenge in Fantastic Four #37, and the Mad Thinker returned in Strange Tales #131. From Rorshach To Father Jack was a favourite episode of Steve’s, as a villain named Professor Jack wreaking havoc at NASA in Strange Tales #132 gave him an excuse to try and include phrase uttered by Father Jack from the TV series Father Ted into the show. The Frightful Four also returned, with perennial lose Paste Pot Pete renaming himself The Trapster to try and reverse his fortunes in Fantastic Four #38. July was all about guest-host Christine Hanefalk of The Other Murdock Papers, who joined us for two episodes looking at Daredevil’s guest-appearances. In Fantastic Four #39, he helps the temporarily powerless team against Doctor Doom, whilst the Puppet Master returns in Strange Tales #133. Our Forty-Fourth episode was The Other Other Murdock Papers Podcast Podcast. Christine returned to help us out with The Final Strange Tales. After 134 issues (and an annual), the Human Torch solo strips wrapped up to make way for Nick Fury: Agent of SHIELD. Unfortunately, the ended with The Watcher turning up to send Ben and Johnny back in time to Camelot to defeat Kang the Conqueror. More germane to our guest-host was Daredevil’s continued support against Doctor Doom – or at least, until Stan and Jack forgot about him and he disappeared halfway through issue #40. Episode 46, Change, My Dear, And Not A Moment Too Soon came with the shocking announcement that Steve and Andy were quitting the show. It was a joke about the live announcement of Peter Capaldi as The Doctor that didn’t really work, but did fool a few listeners along the way. 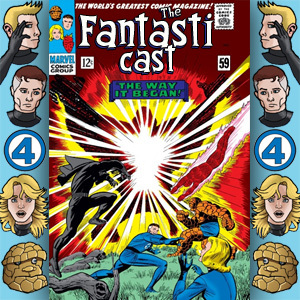 It was our first single-issue show in a very long time, as we continued our coverage of the Frightful Four saga in Fantastic Four #41. Episode 47 was titled Because Just Once Isn’t Enough, a reference to the fact that the original recording became our first lost episode. It’s the episode that featured the truly epic sung saga of how we first came together to produce the show, and may have contained one or two embellishments. The Frightful Four gain Ben Grimm as an extra team-mate in Fantastic Four #42, and a brief look at X-Men #13 reveals Johnny’s role in the first defeat of the Juggernaut. Check back tomorrow for the final part of our year in review. With only a few days to go until the end of the year, and with our podcaster’s choice episode released to wrap up our second year of the show, I thought it would be a good moment to take a breather and look back at where we’ve been in 2013. At the start of the year, we were still covering our favourite spin-off series, Strange Tales, with all of the contrived plotting and rushed artwork that entailed. The Hulk had just completed his throw down with the Fantastic Four and the Avengers, and we’d just finished our first bout of weekly episodes with Michael Bailey. Horny Namor was the appropriate title for our 30th episode, as the permanently-aroused Atlantean monarch decided to kidnap Sue Storm in Fantastic Four #30. The Plant Man made an unheralded return in Strange Tales #121. George Roussos left the main title, and we covered our first issue of Daredevil as the team engage Matt Murdock’s services in Daredevil #2. Shawn Engel, host of Just One Of The Guys was our first guest-host of the year in our 31st episode, Just Three Of The Guys. We covered the first guest-appearance of the X-Men in the Fantastic Four title, inside the covers of issue #28, which also featured the first inking from Chic Stone. Meanwhile, Doctor Doom’s trio of uninteresting super-villains returned to menace The Human Torch in Strange Tales #122. Now With Genuine People Personalities was the Hitchhiker’s Guide-referencing title to episode 32. The astonishing cover to Fantastic Four #29 gave no hint of the Red Ghost’s return during the story. One of the perennial B-list villains of the Marvel Universe, The Beetle, debuted in Strange Tales #123, and we briefly checked in with the final Tales Of The Watcher back-up strip in Tales of Suspense #55. A futile attempt to be topical with regards to the horse meat scandal was the reasoning behind titling episode 33 Bad Horse, Bad Horse. 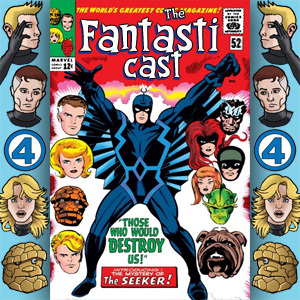 Dave Walker, host of Flash Legacies, joined us to discuss the first appearance of Diablo in Fantastic Four #30 (and give a dramatic reading of Baron Hugo’s classic line ‘Stop! You must not enter the castle of Diablo!’). Meanwhile, Strange Tales #124 saw the return of Paste Pot Pete. The Doomcast was our 34th episode, and featured our coverage of the 1964 annuals. We scored a bit of a coup, grabbing Professor Alan Middleton to join us on the show many months before the launch of the Relatively Geeky Network. We examined Doctor Doom’s origin in Fantastic Four Annual #2, and took a brief look at the back-matter in Amazing Spider-Man Annual #1. 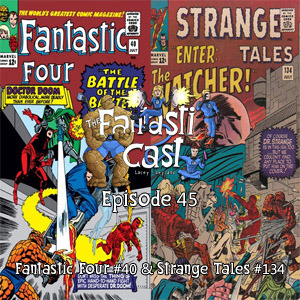 Cryptically titled House Of The Fallen Storm, episode 35 saw the return of the Mole Man in Fantastic Four # 31, and a completely pointless punch-up between Ben, Johnny, and Namor in Strange Tales #125. Finally, we started our extended coverage of Amazing Spider-Man when Johnny got mixed up with the plans of the Green Goblin in issue #17. Episode 36 revealed the shocking reason why John Byrne Quit Comics. The Invincible Man arrived and involved Sue and Johnny’s father in his schemes in Fantastic Four #32. There’s a big surprise regarding his identity, but for the life of me, I can’t remember what it is… The Thinker and The Puppet Master team up in Strange Tales #126, and Johnny turns up in Amazing Spider-Man #18. Meanwhile, episode 37 was titled Yes, Mr Lister Sir, which can only mean that Andy attempted several American accents during the show. We covered one of the strongest issues of Fantastic Four to date, issue #33, featuring a secret assault on Atlantis to protect Namor’s monarchy without his knowledge. Strange Tales #127 surprised us all by not being completely awful, and we took another detour into the world of Peter Parker with Amazing Spider-Man #19. Check back tomorrow for the second part of our year in review. Welcome to The World’s Silliest Comic Podcast! Fred Hembeck, Jim Shooter, Ron Wilson, John Byrne, Michael Golden, John Romita Jr, Al Milgrom, Mike Zeck, Bob Layton, Alan Weiss, Sal Buscema, Mike Vosburg, Kerry Gammill, Keith Pollard, Frank Miller, Denys Cowan, Marshall Rogers, John Buscema, Don Perlin, Gene Day, Walt Simonson, Frank Springer, Brent Anderson, Steve Leialoha, Dave Cockrum, Chic Stone, Terry Austin, John Romita Sr, Joe Rubinstein, Joe Sinnott, John Beatty, Bill Anderson, Ricardo Villamonte, Dan Green, Keith Pollard, Klaus Janson, Bob McLeod, Bill Sienkiewicz. All this, and one of the greatest number one singles of all time. Don’t forget to answer our listener question of the month: We want to know your feel-good Fantastic Four reading experiences! More Johnny today, as he continues to use his flaming powers in ways that defy belief, credibility, and science. He’s on the search for Namor, who has kidnapped Sue. Needing to locate a submersible device beneath the ocean, Johnny remembers how Reed had showed him how to create a probing device with his flame. Presumably, the idea is to use his heat in a similar fashion to the use of sound in sonar and radar devices. This sort of makes sense – both heat and sound radiate outwards from their point of origin. Both react to the presence of objects in their path, either reducing their passage or obstructing it totally. And both reflect off various surfaces. So, initially, this doesn’t seem like such a bad idea. Johnny could be detecting the reflection of his own heat to identify where Namor’s sub is. But what is he using to detect those reflections? I see no measuring equipment, and Johnny’s yet to display any evidence of being able to sense heat, especially when the reflected heat, through water, is going to be less intense than the heat being emitted. No, sorry Johnny, even with Reed backing you up there, it just doesn’t make sense. Don’t forget to let us know your feel-good Fantastic Four reading experiences! 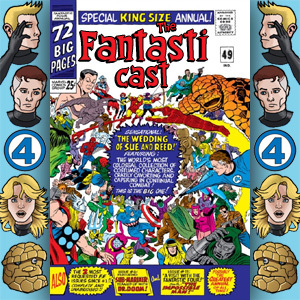 Check out our coverage of Fantastic Four Annual #1 on our sixteenth episode: The Best Of Annuals, The Worst Of Annuals. 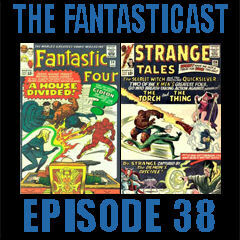 Happy Christmas, and welcome to the first of our two end-of-year special episodes of The Fantasticast. Once again, Steve and Andy are throwing the Lee/Kirby issues out of the window (not literally – we’ve proved over the past two years just how dangerous hardback collections of these comics can be) and are choosing two issues from across the length and breadth of the 53 years of the Fantastic Four. 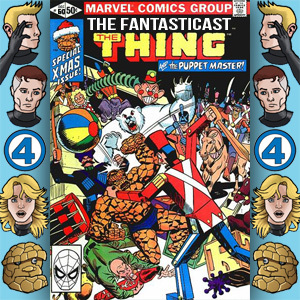 Andy’s selection is up first, and he’s chosen 1981’s Marvel Two-In-One #74, a Christmas-themed team-up between The Thing and the Puppet-Master. With script by Mark Gruenwald and art by Frank Springer and Chic Stone, this story features a guest-appearance from the best bovine midwife in the world – Bova! Another superb Flame On today as Johnny gives chase to Namor to rescue his sister. This panel encapsulates so much that is great about Kirby and Ayers working together – it’s a small panel (one of eight on this page) and yet it’s bursting with detail, from the insinuation of Johnny’s physique beneath his flame to the richly rendered building in the background. At the same time, it shows the frustrations of these small panels – Kirby designs this panel to be a feature moment, yet it feels lost on the page, tucked away in the top corner to allow space to be given to the soapy Namor/Dorma/Sue love triangle. If this annual had come two years later, this moment would have been given more space to breathe, and would have had been more impactful.